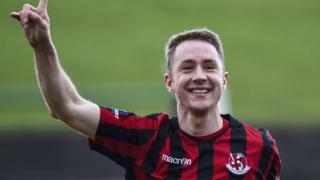 Crusaders move four points clear at the top of the Irish Premiership with a 2-1 victory over Glentoran at The Oval. Timmy Adamson gave the Crues the lead and it was 2-0 on 44 minutes when Paul Heatley's shot was deflected past Elliott Morris by Calum Birney. Jordan Stewart pulled a goal back after half-time but the Glens were unable to conjure up an equaliser.